To be a witness to Jesus is to speak and communicate the things that you have seen and heard in your life, that happened because of Jesus. Its the Holy Spirit who makes Jesus real to us, and makes Jesus real through us. Your testimony is about what you have experienced – what you have seen and heard. A real Christian can talk about their experiences with God through Jesus Christ. We as Christians are called to a relationship of real communication with the Son of God. God comes to live inside us. Things change. God deals with every person in a different way. The more Christians that come forward and talk about how God has intervened in their life, the more people will begin to realize that God is for real, miracles do happen, and prayer works. This will inspire others to seek God and turn from their sins so that they too can know the peace and satisfaction that comes to a person who truly gives their life over to God. Why is it important to share the testimony with the people? Does it have an impact on anyone as you share your testimonies? What happens when you share your testimonies with others? Testimony is a form of confessing what God has done in your life so that others might be encouraged. People’s lives change when they hear or read your testimony. Read the testimonies here and be encouraged. 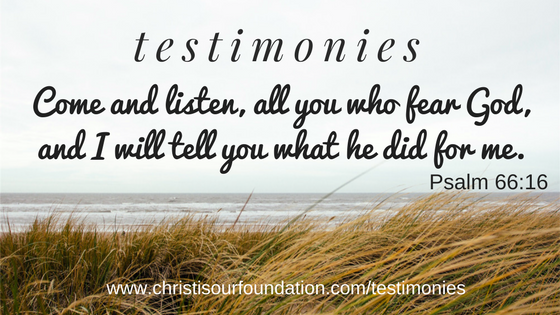 If you would like to share your testimony with us and get it published, send us your testimonies to christisourfoundation@gmail.com. We would love to hear from you and Praise GOD along with you. Don’t worry if you don’t feel like writing out your testimony, you can even send us an audio of your testimony along with your photo.